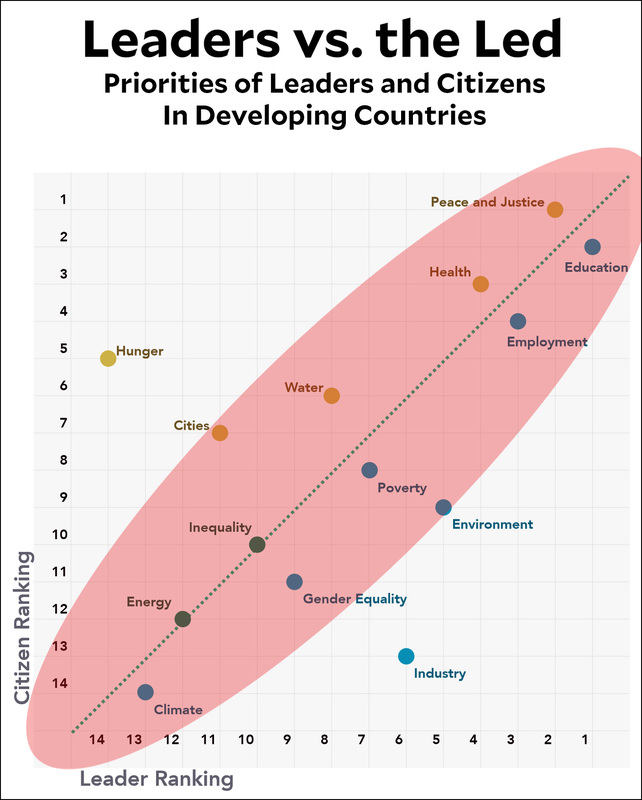 It turns out that leaders and citizens of developing countries mostly have the same priorities. Peace and education are at the top, while climate is at the bottom. But there are two outliers. Citizens are pretty concerned about hunger while leaders couldn’t care less. Literally: it’s their lowest priority out of 14 topics. Conversely, leaders are pretty enamored with attracting industry to their country, while ordinary citizens rank that as practically frivolous. This is a suspiciously tight correlation, as if no one wants to insult the influential. If you’re big and powerful, then yes, we think you’re just the most helpful folks around! The only real outlier is Arab Bank for Economic Development in Africa (BADEA), which is viewed as pretty helpful even though apparently no one thinks they have any real influence at all. 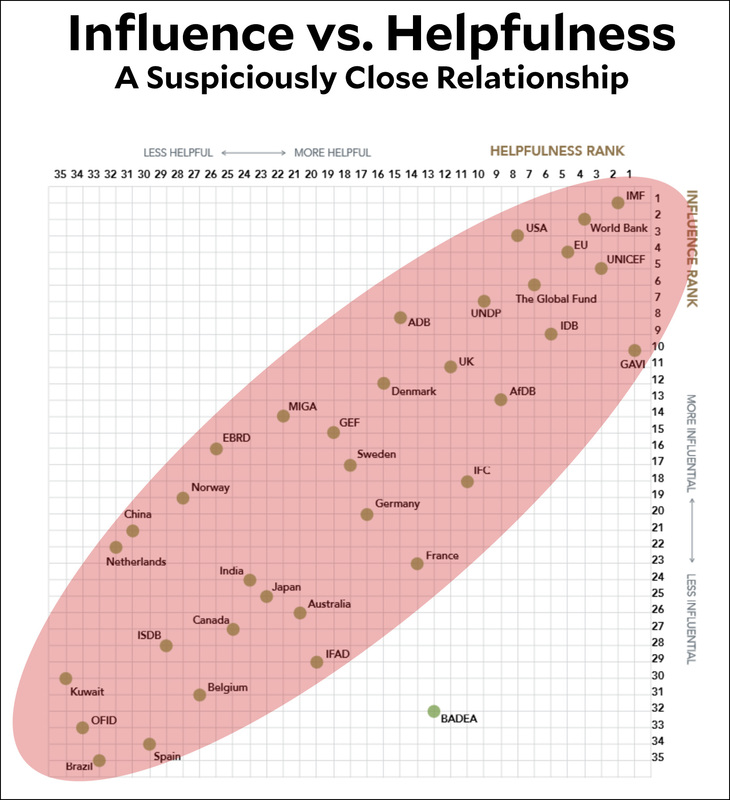 Bill Gates’ GAVI vaccine alliance also does pretty well on this: it’s viewed as the most helpful organization even though its budget is relatively small and its influence is viewed as modest. Finally, here’s a homemade chart that you can all critique. The blue bars show “development aid committed” by whatever metric the report writers have used. The US is on top with $190 billion, followed by Japan at $132 billion and going all the way down to Belgium at $3 billion. But I also wanted to invent a sort of Generosity Quotient, something that suggests how much a country can afford to give. Obviously that depends on both GDP and population, but not in a linear way. In particular, big populations suggest a lower GDP per capita, which means a country is relatively poor even if its total GDP is big. After some noodling, I decided on GDP² divided by population. It seemed intuitively about right, but feel free to provide your own ideas. So this explains the orange line, which shows aid as a percentage of each country’s GQ. By the GQ measure, the US is fairly stingy (16 percent) while Japan is very generous (73 percent). Other countries are in between. The average is a little above 40 percent, which might be taken as a benchmark of some kind. The anglosphere as a whole could stand to be a little more generous, though they often argue that they should get credit for their outsize military budgets, which help to protect shipping lines, keep the peace, and just generally make the world a more stable place. There’s something to this, though there are pretty obviously some issues with just how much stability the US military, for example, has been responsible for lately. But that’s a subject for another day.